The skies are sunny and hot weather is here, which can mean only one thing: patio drinks! From happy-hour pints to quiet nightcaps, on the street, in the back or on the roof — soak in the season by sitting down for a cold one on a hot summer eve (or day, we don't judge). Check out our guide to the best spots to booze outdoors in Toronto's east end. The patio at Ceili Cottage is one of few in the city that can lay claim to being in use year-round. In spring and summer, the inviting outdoor terrace — complete with white-picket fence and blooming flower boxes — is Leslieville's quintessential street patio for post-work hangs right through to late-night shenanigans. The patio at Eastside Social feels like an outdoor living room with wood-on-wood fence and seating and an outdoor fireplace to complete the look. The cozy spot, tucked away at the back of the space, is a chill patio for one-on-one face time over a plate of oysters and a cold pint. The original sign from the Maple Leaf Tavern's days as a sketchy dive adorns its west-facing patio, paying homage to its past. It's here at the beautifully overhauled Gerrard St. hotspot that you can sip rye and gingers and Manhattans on tap or opt for one of the bar's superb handcrafted cocktails. The dark, homey interior of Hitch Bar sits in direct contrast to its bright, airy back patio of nearly the same size. Just as laidback on the outside, a tall fence provides seclusion for grabbing a coveted spot at one of several wooden tables furnished with benches that provide plenty of seating to go around. Spectacular city views, creative cocktails and an expansive outdoor (and indoor) terrace, the Rooftop of The Broadview Hotel might be the best patio in Toronto let alone the east end. If things cool off, the bar features 360 degrees of glass and a giant pyramidal skylight, allowing the venue to stay open year-round. The event space on the second floor also includes an outdoor patio, which houses the neon sign of Jilly's, its long-time tenant before the hotel's revitalization. Emerge from the lovely subterranean bistro to an all-new raised patio that's been several years in the making. Be the first to claim a spot on the tastefully designed 30-seat deck, which makes way for more space for brunch and mimosas in the sun at this east end hot spot. Just like inside, all kinds of plants and greenery will gussy up the outdoor area. The former patio of Lil Baci has been overhauled into a bright, airy 54-seat backyard patio. Bench seating is peppered with greenery and a splash of colour on the wall at this local Italian eatery. It's the perfect spot for an al fresco evening of sharing pizza and sipping wine. Chula opened last summer and quickly became a go-to for its outdoor spaces that includes two patio levels, funky art and glowing lanterns. It's a choice spot if you like drinks like their signature chipotle pineapple mezcal margarita. Did we mention the tiki bar? Squeezing through the narrow corridor that spills out onto the rear patio at Aft feels, you feel as though you just became in-the-know on a secret spot. The patio feels secluded and it's a lively scene in the evenings with its own outdoor bar pouring drinks and serving up hearty plates of southern comfort food. There's even an outdoor TV for game nights. Dirt-cheap beer and food, plus a casual, neighbourly atmosphere make sitting on Stratengers' sidewalk patio a ritual 'round these parts. There's plenty of room to stretch out, and it's not uncommon to see lively groups on the party train mixed with young families having a bite and the odd pooch laying low. Strats, as it's locally known, is usually the first to open in spring and last to close in the fall, and you can bet that you'll see people holding court under its canopy of trees well before they've budded till long after the leaves are gone. It's hard to deny that Barrio's outdoor spaces are some of Toronto's best. With not one but two patios, Barrio is a prime choice to post up for sangria or a cold cerveza. The west-facing patio is great for people watching and offers solid views of Jimmie Simpson Park, while its flipside patio — tucked in between it and its neighbour — has the feel of a courtyard lounge with brick walls, string lights and cozy seating. It's also heated for cooler evenings in the shoulder season. You can take in all of the action of Little India from the patio of this Gerrard St. bar. The outdoor space at Eulalie's Corner Store effectively doubles its footprint come summer and there is plenty of shade to take cover. Cozy and secluded, Brooklyn Tavern's backyard patio feels like an in-the-know space that's far removed from the action of Queen East. Lush greenery hangs on the fence and warm lighting brings evenings to life at this Leslieville spot that's just as fitting for after work drinks as Sunday dinner. The Duke takes a beating for its rough-around-the-edges clientele and wobbly status that straddles a murky line between live music venue and seedy day bar. But its upgraded garden patio — complete with a gazebo, no less — feels downright luxurious. The massive outdoor space has seating for 100, and features theatre-size wall projection during big sports games. Add in cheap beer, and it's the perfect spot to, well, day drink. A rarity in the east end, Murphy's Law has a three-storey rooftop patio that towers over the corner of Queen and Kingston Road and provides superb sightlines into The Beaches. 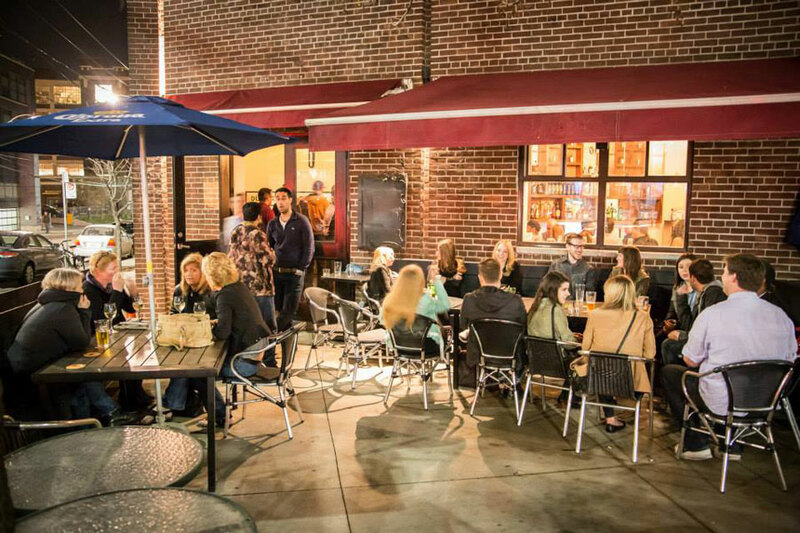 If heights aren't your thing, the pub also has a popular street-level patio at the entrance as well as a large back patio making for a massive amount of outdoor space. Murph's pulls 24 taps of craft beer and has over 20 bottles in the fridge. The backyard patio at Leslieville's What Are You Looking At is charming and initimate. A high wooden fence keeps the space feeling private while wraparound bench seating is padded with colourful cushions and umbrella'd tables. The patio here might be small but it doesn't stop the dancing from heading outdoors on warm nights. Triple A Bar's newest outpost in East Chinatown serves up cold beer and Texas-style barbecue on its sun-drenched side patio. Hit it up for a quick bite and pint after work (bring your kids) or take it deep into the night. The 30-seat patio is open until 2 a.m.
At the corner of Queen East and Curzon, the patio at Lambretta Pizzeria recently received a makeover with new seating and lighting, and features the restaurant's Roman-style pies. The patio faces east making it an ideal spot for afternoon hangs without having to take on the full force of the sun.